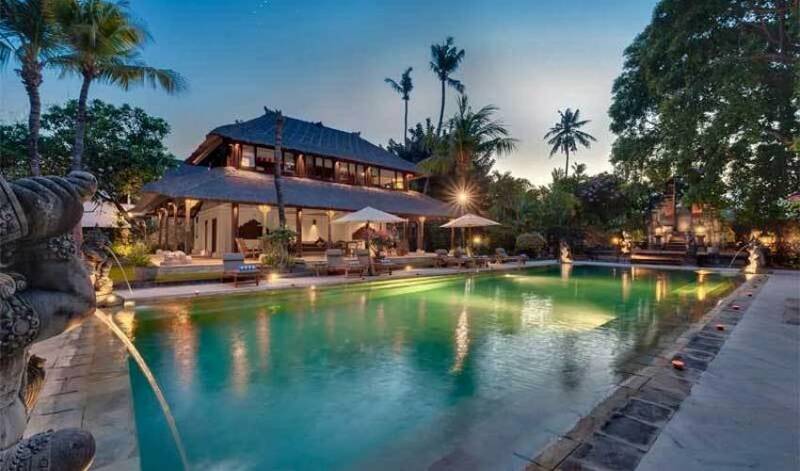 Villa Batujimbar is one of Bali’s most extraordinary residences, with a rich and colourful history, a grand ‘Bali style’ design pedigree, and a celebrity houseguest list that includes ruling monarchs and rock legends. 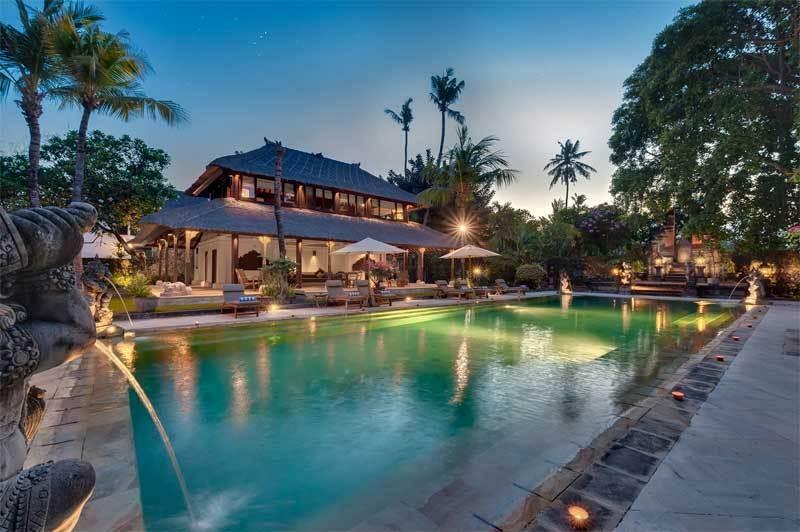 Within its enchanting gardens – situated right by the beach in Sanur’s exclusive Batujimbar Estate – are eight bedrooms, multiple living and dining pavilions, and a 20-metre pool and tennis court. 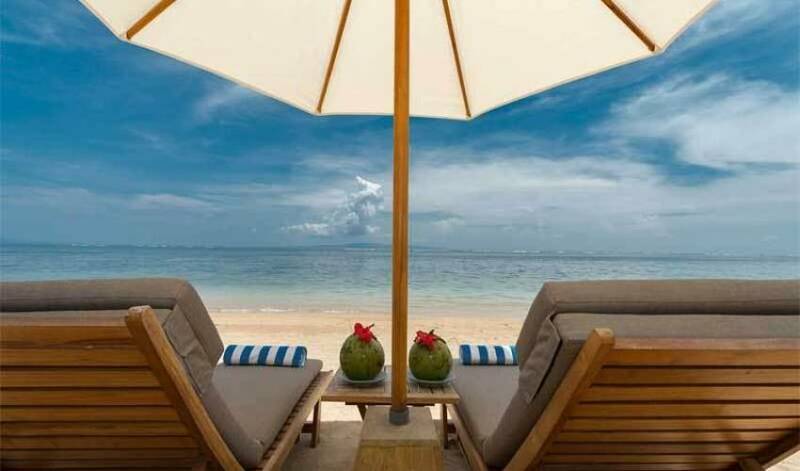 There’s direct access onto a glorious white sandy swimming beach from the gardens, and Sanur’s many restaurants and boutiques are a five-minute walk away. The villa is the perfect choice for family get-togethers and groups of friends, and a captivating setting for weddings. 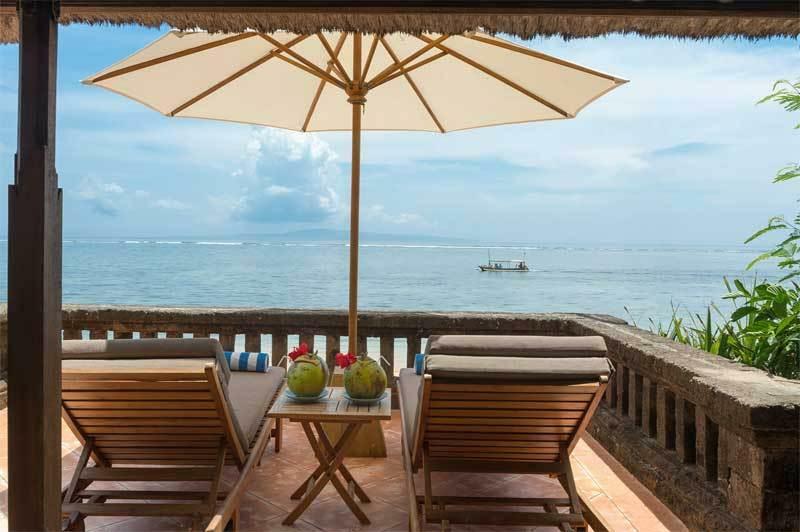 If anywhere epitomizes the authentic ‘Bali style’ that has enraptured so many over the past decades, it is this villa – a treasure-filled travel destination in itself. This sublime property, which sits on over an acre of beachfront land, was originally the home of long-time Bali resident and Australian artist Donald Friend who, in 1970, invited Sri Lankan ‘tropical modernism’ architect Geoffrey Bawa – celebrated for breaking down barriers and creating harmonious relationships between buildings and landscape – to collaborate in developing the beachfront estate. The Balinese palaces at Amlapura and Klungkung plus the famed water gardens of Tirta Gangga influenced his ideas – clearly expressed in the two-storey moat-encircled Lembu Bale that commands centre stage within the meticulously designed gardens. The lower gallery of the Lembu Balé houses the current Australian owner’s astonishing collection of Balinese art – including the Donald Friend painting he bought from the artist himself on first visiting this villa in 1972. This private collection rivals the island’s finest galleries and museums and is a unique feature of the villa. Guests are welcome to view the collection on special request. Yet art is not confined to this space alone throughout the living and sleeping pavilions you’ll come across architectural treasures, rare artefacts, painted antique doors and windows, and heirloom paintings that reveal the owner’s passion for Balinese art and craftsmanship. And within the expansive gardens are myriad moss-encrusted statuary and intricately carved stone reliefs. 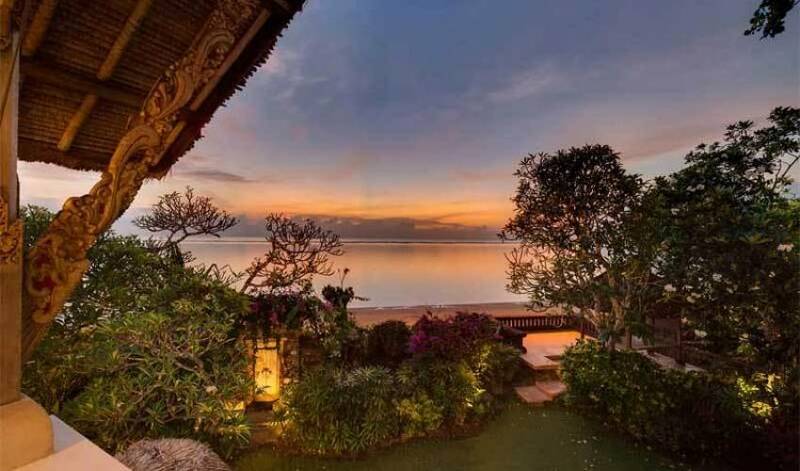 Bali’s beauty shines in the materials used too – vaulted alang-alang thatched roofs, lava stone steps, coral walls, and terrazzo and teakwood floors. With such a fascinating history, no wonder this villa has attracted celebrity guests over the years. Today’s guests are following in the footsteps of Mick Jagger and Jerry Hall (who got married here), Sting (who gave an impromptu concert), Yoko Ono, and members of the Thai and Malaysian and British royal families. In such splendid surroundings, and pampered by a team of staff that includes a private chef, personal butlers and villa manager, you can look forward to royal treatment too. 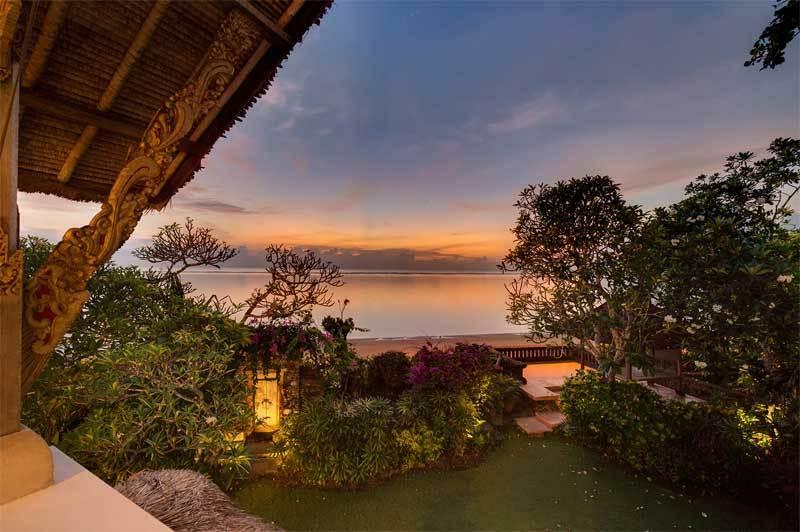 Influenced by traditional Balinese family living, the villa comprises a series of alang-alang thatched pavilions spread through the substantial estate. At its centre is the Lembu Bale – a moated double-storey brick-built pavilion which houses an open-sided lounge on its upper floor looking onto the swimming pool on one side and across the gardens to the ocean on the other. Closest to the beach are the living pavilion and the dining bale, and to one side is the Longhouse, comprising two bedroom suites, a formal dining room and professionally equipped kitchen. Opposite is the Bali Pavilion, with two bedrooms, garden bathrooms and courtyard. Furthest from the beach, two more guest bedroom suites occupy the two-storey Pool Pavilion and share an open-fronted living area looking onto the 20-metre swimming pool. Two additional bedrooms are housed in the Family Pavilion situated above the gym near the villa entrance, while a tennis court and shower room lie just across the driveway. One of the pleasures of a sojourn at the villa is the sheer amount of living space. While there’s plenty of room for a full house to socialise under the same roof, there are also lots of quiet corners for breaking away from the crowd. A breezy, fan-cooled lounge graces the upper level of the historic Lembu Bale, reached by a pair of stately staircases. With its roof supported by elaborate columns rooted in sandstone plinths carved in the shape of animals and mythical figures, this space is defined by two monumental bovine statues (lembu means cow in the Indonesian language). 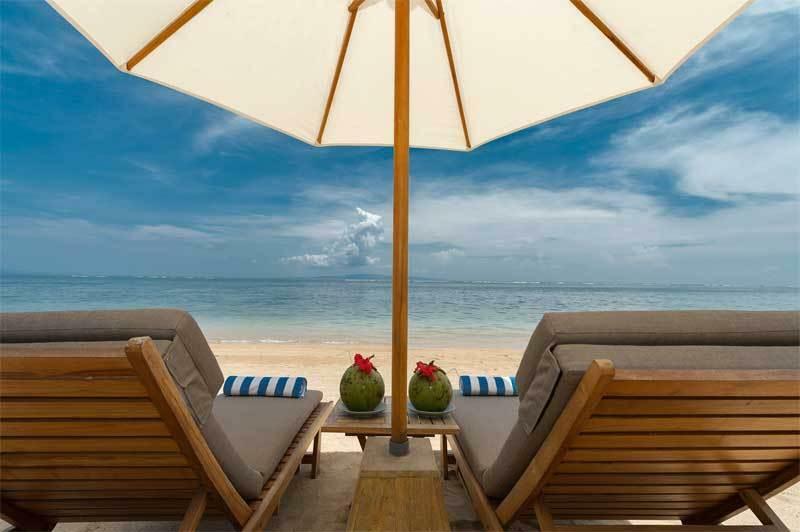 Cane and teak colonial-style seating provides the perfect spot to enjoy the sea view. Guests have a choice of dining areas. Towards the beach is an enchanting raised dining bale with antique marble table and ten rattan chairs set under a thatched roof. For formal meals, there’s an air-conditioned dining room in the Longhouse, where a 12-seater stunning teakwood table faces sliding glass doors that open onto fish ponds. Next to the dining room is a huge professionally equipped kitchen and, behind, a staff service kitchen and laundry. In the villa’s fabulous formal gardens ancient moss-encrusted statues stand sentinel by the 20-metre pool whose stone terrace is lined with sun-loungers and parasols. Seemingly floating above a lotus pond is a largerelaxation bale – the perfect spot for afternoon tea while admiring scenes from the Ramayana and Mahabarata carved into the wall behind. 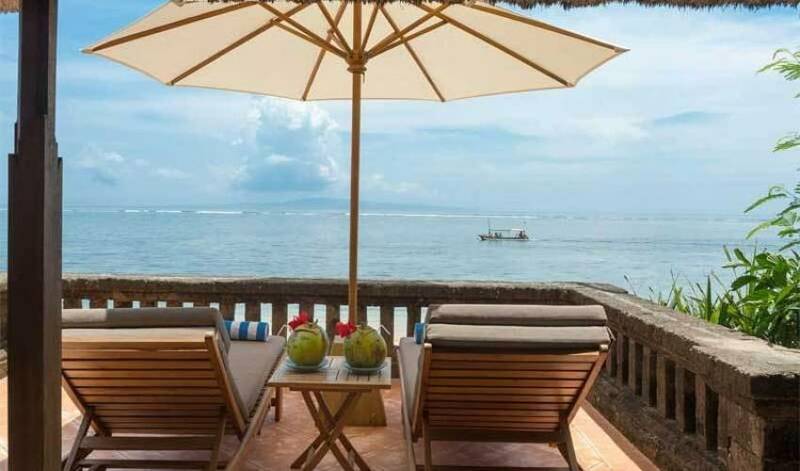 From the beachfrontbale glorious views across the sea to the sacred Mount Agung and the island of Nusa Penida can be enjoyed; Sanur’s acclaimed sandy beach and sheltered waters lie just beyond the traditional gate in the boundary wall. 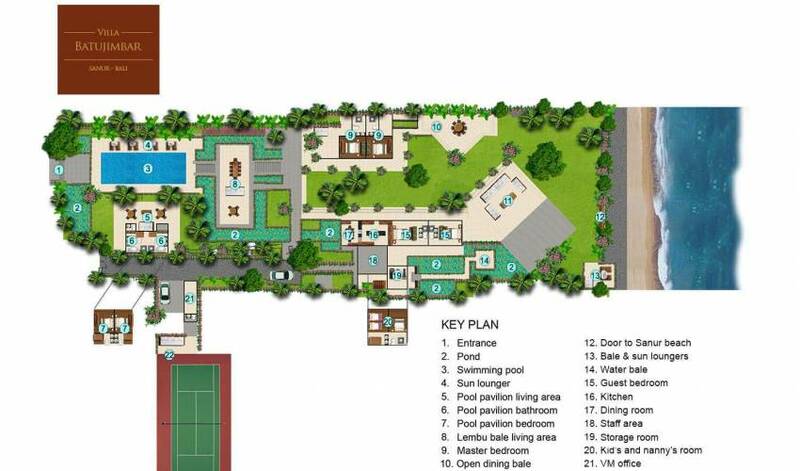 Elsewhere on the estate are the tennis court and gym, refreshment area and sports shower. The villa offers eight spacious air-conditioned bedrooms, each oriented for privacy in four separate pavilions. Six have ensuite bathrooms while the two Family Pavilion bedrooms – one designed for kids – share a shower room. All have contemporary luxuries such as 40-inch or 32-inch satellite channel TVs, safes and bar fridges, matched with historic paintings, collectibles, furniture and oriental rugs that hark back to the villa’s distinguished heritage.